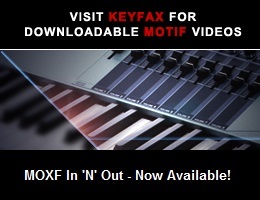 Viewing topic "Korg O1/W Dyno Piano Multisampled for Motif XS/XF"
Good news: the links are working now! Rapidshare changed the default folder settings from public to private. Finnaly I could adjust the permissions for every folder and the folder is public now. This is my new library released: The legnedary Korg O1/W Dyno Piano ready for use on Motif XS / XF. This work was well done, from the samples to the programming voices. You will be very happy with its sounds and autenticity. -The O1/w voice was sampled in 3 levels of velocity. -There are 11 new voices on USR 1 area. -The sample total size is 165MB, so you need DIMM or Flash Memory. -Just load it as ALL VOICES and start to play. -Save all your Motif’s works before loading this library, otherwise the voice banks will be lost. I’m trying to download this file but it does not exists. Can someone share it with me? I share for you, give me your email in PM. Tryed to dend om but do not work in Chrome on android.